Back in the early days of his Matchroom empire, Barry Hearn had a notion, an idea for an earner, something that would bring in serious amounts of "ban-doos" for his company while portraying his snooker clients as sophisticated men of the world. The smell of success was what he was thinking about. It was October 1984 and Hearn was getting into mass-market masculine toiletries. There were rivals, of course. But there were also opportunities. So what if Old Spice, Brut and Hi Karate were the established brands. He'd take 'em on. He'd make it happen. He launched his Matchroom fragrance in a blaze of publicity. "For Men Who Play To Win" was the catchphrase. Hearn went on television with his new product, had posters on the London underground and adverts on buses. He had his clients going around snooker tournaments with bottles of the stuff, splashing it on and sniffing each other. And, for a while, it worked. In cataloguing his myriad marketing triumphs, the early success of his fragrance of fir needles, pimento and nutmeg infused with oak moss, tonka beans and Caribbean limes - but what was, effectively, Essence of Terry Griffiths - has a place in the Hearn pantheon. A man who can bang out bottles of aftershave with Tony Meo's face on the label is a man you've got to respect. When the Scottish Football Association invited Hearn to address their inaugural convention at Hampden on Wednesday, they knew what they were doing. They knew that Hearn wasn't going to walk in the room and soft-soap the delegates from the 44 clubs represented. The chances were that he was going to give it to them with both barrels, a dose of reality about the real world of sports promotion, right between the eyes. If there was any doubt about it then he disabused folk right from the get-go. "I'm not an expert on Scottish football," he told the assembled cast of chairmen, chief executives and committee men and women of all kinds. "Listening to your [financial] figures, doesn't seem like you are either." He got a laugh from the floor. He got laughs for a lot of things during the course of an hour on his feet and then half an hour talking to the media later on. Hurricane Hearn blew into Hampden and then blew out again, destined for the Mosconi Cup in Blackpool on Wednesday night. If you've got any cash, he'll tell you about it. Europe versus the USA in the Ryder Cup of pool. Delivered by Matchroom. The colour of money. Lovely. At Hampden, he conjured up images of where Scottish football is at, based on the research he'd done for his speech, the most research he said he had done for any speech in years. He equated the domestic game to being stuck in a bad marriage where the partners just plod along in collective misery. He said he read the various reports on the health of the game going back years and felt like the walls were closing in. It was, he said, depressing stuff. "All I can see is a mess," he remarked. "There's no optimism. You're going around looking at your shoelaces and people [broadcasters] are taking advantage." The headlines are already out. He thinks it's a disgrace - he used the word half a dozen times - that the flagship league in Scotland has no sponsor. He can't comprehend that. He scrunches up his face in a way that says 'what seventh circle of marketing hell is this?' when told it's been two and a half years since there was a sponsor for the top competition in Scotland. He says people should be allowed to buy a beer in Scottish football stadiums. In developing his point, he uses flowery language that we have to paraphrase, suggesting that the football authorities might want to grow a set of, er, policies in an attempt to persuade government to change the law. "I look at Scottish football and see a nation with its head down looking at its shoelaces. You're better than that. When I started off with the darts and snooker, we were way down, but we believed in ourselves and had a bit of a passion. Sometimes organisations get into that mode of 'Oh, that's how it is'. "They are totally lazy and set in their ways. The fact you've got a Scottish Premiership without a sponsor. 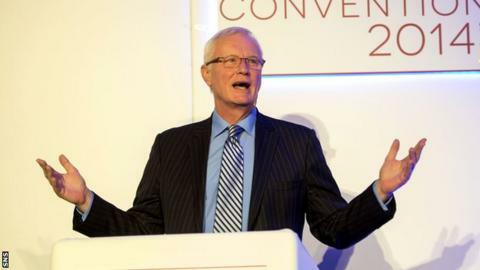 Do you know how long you'd work for Barry Hearn if that was the case? I won't even tell you how long because that's not a performance I'm looking for. You wouldn't have time to take your coat off. You'd be in the car park." The customer experience. He said it over and over. Sell the game. That was another mantra. Even if your product is not good, he said, then make like it is. When doing business "dress the operation in the clothes of a King even if you're a pauper". Make believe that you are going places and that they better get on board. Stop looking down. "You've got to grow. You've got to be positive. You can't expect people to take you seriously if you don't take yourself seriously. If you live in everyone's shadow then you never come out of that shadow. The fact the league doesn't have a sponsor says everything you need to know. "I know football is different and there are complications. But things like the alcohol ban. How on earth have you put up with that over the years? It's obscene. It's actually insulting for people who go to a football match. And don't say 'I served a beer and there was trouble' because it's your job to make sure there is no trouble. People will be people, but the customer experience is all part and parcel of why your gates are dropping. "It's not just the level of football. Two donkeys make a great race. You don't have to be the best in the world to be entertaining. "I put on fights that are not good sometimes, but they're entertaining. On Saturday, I've got eight lightweights. None will win the world title, but they'll all be brilliant fights because they'll be kids going for it and everyone will go home happy. They've paid £150 a ticket and I've made a fortune. "Sometimes you get stuck up your own backside with this blazer mentality. I can't stand blazers. Everything comes down to money and the clubs are starving. "My message to the leaders would be to wake up and smell the coffee. I can't say any more. I don't know these people personally, but they're not unsuccessful people. "The mystery in my mind is how someone with a background in commerce, or wherever, who has run successful companies and can't see the validity of common sense. That's a mystery. "My wife constantly reminds me 'you're just a working class yobbo' and I say 'I ain't done too badly for a working class yobbo'. But I've got a basic understanding of how to exploit things to their maximum and most of it is just hard work." And less excuse-making. Hearn spoke about the crutch of the recession as a catch-all explanation for falling attendances. He's not having it. He laid waste to the Scottish Professional Football League's lack of appreciation of world media markets and the possibilities of social media. Hearn comes from a world of hustle. He says he wakes up every morning and, before he heads out the door, his wife says 'have you got your begging bowl out again today?' And his response is a gleeful 'too bloody right'. He expanded further, using the kind of imagery to illustrate his claim he's value for money that some might find uncomfortable, but who's happy? Hearn, with his successful empire that's now building anew in the hands of his son, Eddie? Or Scottish football, where pockets of progression in places like Spartans are dwarfed by strategic thinking straight from the Mr Magoo playbook? Hearn might have given Jimmy White the nickname Whirlwind, but given his presence at Hampden, he might as well have applied it to himself.